Iran's Revolutionary Guards - A Rogue Outfit? There is a tendency in Western capitals to dismiss adversarial Iranian behavior as the work of rogue regime factions, which are not representative of Tehran's true intentions. Following a Baghdad press conference providing evidence of Iranian weapons shipments to Iraq, U.S. officials raised doubts about Iran's actual culpability. The weapons shipments do "not translate to that the Iranian government per se, for sure, is directly involved in doing this," Peter Pace, chairman of the Joint Chiefs of Staff, noted the next day. On February 14, 2007, President George W. Bush said, "What we don't know is whether or not the head leaders of Iran ordered the Qods Force to do what they did." Likewise, when the Islamic Revolutionary Guard Corps (IRGC) seized fifteen British sailors patrolling a waterway between Iran and Iraq, commentators suggested that responsibility may rest more with freelancing commanders than the Iranian government. Identifying the true decision-makers in the Islamic Republic is essential not only for accountability but also to ensure that any Western diplomatic outreach is targeted at those who have the power to affect regime behavior. Unfortunately, as U.S. officials again debate negotiations with the Islamic Republic, they simultaneously embrace Iranian reformists and dismiss pariah behavior as the actions of isolated rogue elements. Such an assessment is backwards, though. The IRGC represents the core of the Iranian state, and Iran's reformists are those who, by acting on their own without either state support or any ability to deliver on promises are, in the Iranian context, the true rogue elements. The Islamic Republic's overlapping and sometimes parallel power structures often confound Iranians, let alone outside observers. Since revolutionary leader Ayatollah Ruhollah Khomeini's 1989 death, Western officials have often focused their hopes for engagement and their anger at Iranian behavior on the president. Whether Ali Akbar Hashemi Rafsanjani's advocacy of market reforms, Mohammad Khatami's call for a "dialogue of civilizations," or Mahmoud Ahmadinejad's Holocaust denial, the Iranian president frequently makes headlines in the West. Such attention is deceptive. Iranian presidents appoint cabinets but remain subservient to the Council of Guardians and the Expediency Discernment Council. Revolutionary foundations, which together may control more than half the state budget, operate outside the purview of Iran's executive structure. The judiciary is also a power center, able to wield immense influence beyond even the confines of the court system. Over all these, however, the "supreme leader" (rahbar) has ultimate control. Khomeini was the first supreme leader, but upon his death, Ayatollah Ali Khamenei assumed the role. Article 107 of the Islamic Republic's 1979 constitution defines the responsibilities of the leader: "He is to exercise governance and all the responsibilities arising therefrom." Article 110 makes the supreme leader "supreme commander of the armed forces" with the power to appoint and dismiss the chief of the general staff and the commander in chief of the Islamic Revolutionary Guard Corps. In addition, the supreme leader forms the Supreme National Defense Council and appoints the supreme commanders of the army, navy, and air force. He also appoints the heads of the judiciary, the president of state radio and television, the editor of Kayhan daily, executives to oversee editors of nominally independent newspapers, and Friday prayer leaders who act as his de facto representatives on a provincial or town level. Unofficially, myriad vigilante groups also enable the supreme leader and his followers to enforce domestic discipline outside constitutional parameters. On a day-to-day basis, the supreme leader exerts control through the Office of the Supreme Leader and a system of handpicked representatives who act as his commissars. Very little is known about the internal functioning of this office, but it probably controls at least 2,000 clerical commissars who permeate every bureaucracy and power center inside Iran and, quite possibly, a few Iranian embassies and cultural centers outside the Islamic Republic's borders. Supreme Leader Ayatollah Ali Khamenei's network of representatives allows him to manage the structure and trajectory of state policy without controlling every lever of power. Should any political or policy problem arise, Khamenei's network warns him long before the news would reach his level through the formal hierarchy of power. Khamenei can, therefore, maintain control through veto. If Khamenei's will is supreme, the IRGC is his Praetorian Guard. It emerged in the wake of the Islamic Revolution as a privileged counterpoint to the Iranian army, which the first supreme leader, Ruhollah Khomeini, distrusted. Throughout the twentieth century, the Iranian army was subordinate to the person of the shah rather than acting as an institution charged with defending the state. Especially after the challenge from and, eventually, the coup against Mohammad Musaddiq, the shah became dependent upon the army to maintain his rule. He placed family members in key commands and lavished patronage upon senior officers to buy their loyalty. Junior officers and enlisted men felt no such loyalty, however, and as the tide turned ahead of Khomeini's return, many defected to the revolutionary mobs. Upon seizing power, Khomeini may have needed the army to ensure order and national defense, but he never trusted it. At best, he felt the army was comprised of opportunists who joined the revolutionary forces to save their own lives. At worst, he believed they had been loyal to the shah even if they did not choose to fight for him. As Khomeini purged what remained of the senior officer corps, he formed the Revolutionary Guards as the ideological guardians of his new theocracy and a trusted counterbalance to the army. The IRGC's structure suggests the organization adheres closely to the Islamic Republic's values and goals, if not outright to regime command and control. Initially, Khomeini incorporated the IRGC into the cabinet. Mohsen Rezai served as the group's first and only minister and continued his command after Khomeini made the IRGC a wholly separate entity. Throughout its existence, the IRGC has had remarkably stable leadership. Rezai helped stabilize the country after Khomeini's death and ensured a smooth transition to Khamenei's rule. Only on September 9, 1997, did the supreme leader relieve Rezai of command and, even then, in a manner to provide institutional stability, appointing Rezai's deputy, Yahya Rahim Safavi, as the IRGC's new commander in chief. Safavi, in turn, commanded the IRGC for a decade until September 1, 2007, when Khamenei replaced him with Mohammad Ali Ja'fari, the former director of the IRGC's Strategic Studies Center. In neither case did the leadership transition signal disgrace for the retired chief. Today, Rezai is secretary of the Expediency Discernment Council while Safavi serves as armed forces and security advisor in the Office of the Supreme Leader. Are the Revolutionary Guards Rogues? During the Clinton and George W. Bush administrations, the White House and State Department have often treated the IRGC as a loose cannon in the Iranian system, if not a rogue element. The IRGC's evolution and role, however, suggest that the group has seldom engaged in activities not sanctioned by the Iranian leadership. Initially, the Guards functioned to ensure internal security only, but Iraqi president Saddam Hussein's 1980 invasion of Iran pushed the organization into national defense. The Iran-Iraq war transformed the IRGC into a multifaceted organization. The Iranian leadership invested massively in the organization as the Islamic Republic fought for its very existence, and the IRGC resultantly developed not only traditional defense capabilities but also embraced its mission to enforce revolutionary values at home and export them abroad. For this latter responsibility, the Office of Liberation Movements played a key role. Charged with supporting revolutionary movements abroad, the office was, until 1982, part of the Revolutionary Guards and helped catalyze the rise of Shi‘i terrorist and revolutionary movements in Lebanon. Led by Mehdi Hashemi, a well-connected revolutionary, the office continued after its separation from the IRGC as an independent entity coordinating not only operations in Lebanon but also aid to the Afghan mujahideen. While the office had lost its official status—giving the Iranian leadership plausible deniability from its activities—it based itself in Grand Ayatollah Hossein Ali Montazeri's office in Qom and so, clearly, enjoyed state sanction: Montazeri at the time was Khomeini's deputy. As Iranian casualties at the front increased, Tehran's diplomatic priorities shifted. Khomeini sought to reach out to the Gulf Cooperation Council states, which were financing Iraq's war machine, as well as other adversaries, including the United States. Hashemi, however, did not believe the Islamic Republic should compromise its revolutionary principles. In 1986, he allegedly sent Iranian operatives disguised as pilgrims to the hajj in Mecca. Saudi authorities arrested more than one hundred Iranian pilgrims, many of whom had arms and explosives. Soon after, Hashemi allegedly orchestrated the kidnapping of Syria's chargé d'affaires in Tehran. On November 3, 1986, by coincidence the day before the anniversary of both Khomeini's 1963 arrest and the 1979 U.S. embassy seizure, Ash Shira‘a, a pro-Syrian Lebanese magazine, broke news of the secret contacts between U.S. and Iranian officials that would come to be called the Iran-Contra affair. Hashemi and the Office of Liberation Movements had become a liability. What had once been sanctioned had now become a rogue operation. On October 12, 1986, the Iranian government arrested Hashemi and his followers; he was executed at dawn on September 28, 1987, by a firing squad at Tehran's Evin prison. The Mehdi Hashemi affair is instructive: It demonstrated that while the Iranian leadership holds revolutionary values closely, it is also pragmatic and chooses when and when not to export them. Hashemi had crossed a line; when sanctioned activities became rogue operations, the Iranian leadership reacted swiftly and without mercy. By comparison, then, Tehran's failure to act in a like manner to constrain other instances of revolutionary export suggest that such violence, incitement, and support for insurgency have the supreme leader's support. From the ashes of the Office of Liberation Movements rose the Qods Force, an elite corps of several thousand soldiers within the IRGC charged with export of the revolution and liquidation of opponents, both inside and outside the Islamic Republic. The supreme leader personally appoints the head of the Qods Force, making him, in effect, the equal of the IRGC head. What did the Imam [Khomeini] want, and what was his purpose of exporting the revolution? [Did he wish that] we should export revolution by means of gunpowder or groups sabotaging other countries? … He [Khomeini] meant to establish a role model here, which means people should see that in this society, the economy, science, and dignity of man are respected … This was the most important way of exporting the revolution. By proposing that Tehran should expand its influence more by soft power than by insurgency, Khatami tacitly acknowledged that the sponsorship of militias, insurgency, and terrorism enjoys state sanction and does not constitute rogue behavior. The reaction of various Iranian officials to Khatami's speech underlines such a conclusion. Seventy-seven members of parliament demanded the Intelligence Ministry investigate the former president for his comments. Iranian officials disapproved of Khatami's acknowledgment of activities for which the Islamic Republic tries to maintain plausible deniability. Tehran might use proxy groups and assassination squads to strike at enemies and liquidate dissidents, but it does not wish to be held accountable for such actions on the international stage. As the controversy over Khatami's remarks faded, Ayatollah Mahmoud Hashemi Shahroudi, the powerful judiciary chief, enunciated Tehran's continued commitment to exporting the revolution. Speaking to armed forces in Iran's northwestern Kordestan province, he said, "Know your worth since today we are in a position that you are the hope of Islamic national and Islamic liberation movements." The Iranian debate about exporting the revolution is not theoretical and limited only to theological seminaries or political speeches. In the Islamic Republic's first twenty-nine years, regime officials have assassinated more than 160 regime opponents outside Iran's borders. While many of these killings occurred in the tumultuous years after the revolution as hit squads tracked down the shah's chief aides and revolutionary defectors, assassinations of dissidents have continued through, at least, the 1990s. While in many cases the perpetrators escaped or evidence was inconclusive, in the aftermath of several high-profile attacks, investigations uncovered official regime involvement. On July 13, 1989, gunmen assassinated Abdol-Rahman Ghassemlou, head of the Kurdistan Democratic Party of Iran (KDPI), along with a KDPI representative in Europe and an Iraqi Kurdish mediator as the three met with an Iranian delegation in a Vienna apartment. The Iranian delegation reported the shooting to the police but denied any responsibility. After taking statements, the Austrian police released the Iranian government representatives present in the apartment at the time of the assassination, Mohammad Ja'fari Sahraroudi, Iranian Kordestan provincial governor Mostafa Ajoudi, and Amir Bozorgian. Only in subsequent days did questions about the Iranians' statements arise. Oswald Kessler, the head of the Austrian Special Anti-Terrorism Unit, noted that there had been no forced entry into the apartment, two of the victims were shot as they sat, and that each victim had received a coup de grâce to ensure death. He concluded that the murders were an intelligence operation. Subsequent forensic evidence supported Kessler's conclusions; shots had been fired from the position of the Iranian delegation and not from the door. Shell casing positions also suggested the Iranian delegation's complicity. Three months after their deportation, Austrian police issued warrants for the three Iranians, but Tehran refused to extradite any of the wanted men. In sharp contrast to the manner in which the regime treated Hashemi in the wake of his 1986 rogue operations, the IRGC promoted Sahraroudi to brigadier-general and appointed him to head the Qods Force Intelligence Directory. The Ghassemlou affair was not the last Iranian operation against Kurdish dissidents in Europe. On September 17, 1992, shortly after the German government began its critical dialogue with Iranian leaders in order to end Tehran's isolation, two Iranian hit men assisted by four Lebanese Hezbollah operatives murdered three KDPI leaders and a supporter at the Mykonos Restaurant in Berlin. While one of the gunmen, Abdol-Rahman Banihashemi, and a getaway driver fled the country, German police arrested Hezbollah operative Abbas Hossein Rhayel—the other gunman—and several accomplices. The subsequent trial lasted more than three years, heard 176 witnesses, and gained access to intelligence files. On April 10, 1997, the court found Rhayel and Kazem Darrabi, an Iranian intelligence agent, guilty of murder and two other Lebanese as accessories to murder. The court also concluded that a Special Affairs Committee, headed by the supreme leader and including Rafsanjani, former intelligence minister Ali Fallahian, and former Iranian foreign minister Ali Akbar Velayati, had ordered the hit and that Fallahian had put Banihashemi in charge of organizing the operation. Fallahian may have rejected the verdict, but shortly before the assassination, he had bragged on state television about the Intelligence Ministry's success "dealing vital blows" to the Kurdish opposition outside Iran. As instructive as the case was about state sponsorship of terrorism, so, too, was the aftermath. The next day, approximately 1,000 Ansar-e Hezbollah activists gathered in front of the German embassy in Tehran. Hossein Allah-Karam, the head of the hard-line vigilante group, warned, "One of our followers will strap a bomb to himself and blow up the embassy if Germany continues its accusations and hostile attitude against our leaders." Three days later, a group of 250 students clashed with police in front of the embassy. The students issued a statement warning, "If ever the guide [Khamenei] orders us, we will wage a holy war against the infidels … We are conquerors of spy nests [a reference to the U.S. embassy]." Iranian authorities promised to protect the embassy. German foreign minister Klaus Kinkel noted wryly, "Since suicide commandos only seem to act on orders from the government … we will take the Iranian government at its word." Kazem Darrabi (in cap), sentenced to life imprisonment for murder by a German court, was released after serving fifteen years. Here, he arrives in Tehran to a hero's welcome, December 11, 2007. He had been convicted of involvement in the murder of three leaders of the Iranian Kurdish Democratic Party (KDPI) and their translator in Berlin. The German government freed Darrabi as part of its effort to engage Tehran. 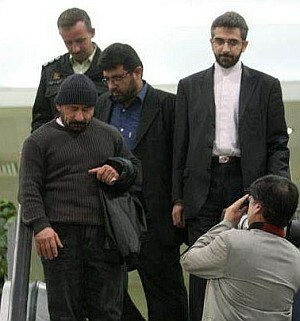 Despite his life sentence, Berlin freed Darrabi on December 11, 2007, as part of its effort to engage Tehran. He immediately flew to Tehran where he was greeted by Ali Bagheri, the acting head of the Iranian foreign ministry's European affairs department, and received a hero's welcome. The allegations of top-level regime involvement in terrorism again surfaced after a July 18, 1994 suicide truck bomb attack leveled the Asociación Mutual Israelita Argentina (AMIA), the Jewish cultural center in Buenos Aires, killing eighty-five people and wounding almost twice as many. While terrorists had also attacked the Israeli embassy in the Argentine capital two years before, investigations kicked in after the 1994 attack. After years of inconsistent Argentine attention to the investigation, Judge Rodolfo Canicoba Corral found guilty and issued an arrest warrant on November 9, 2006, for Rafsanjani, Velayati, Fallahian, the IRGC's Mohsen Rezai, IRGC officer Ahmad Reza Asgari, who served as third secretary of the Iranian embassy in Buenos Aires, and Qods Force commander Ahmad Vahidi, subsequently Iran's deputy minister of defense for procurement. Crucial to the case was Ahmad Rezai, son of Mohsen Rezai, who defected to the United States in February 1998. He acknowledged that "the attack on the Israeli embassy in Buenos Aires was planned in Tehran" and said that then-president Rafsanjani had decided to order the attack after an August 14, 1993 meeting in Mashhad at which Ahmad Rezai was present. The Iranian government continues to deny the charges, but after conducting an investigation of its own, Interpol found them credible enough to publish "red notices" for five of the implicated Iranians. The U.S. military commitment in Iraq has made the question of rogue Iranian behavior literally a matter of life and death for U.S. servicemen and a topic of intense discussion among diplomats and policymakers. In 2003, as Operation Iraqi Freedom neared, Western diplomats scrambled to win an Iranian pledge of noninterference. British foreign secretary Jack Straw elicited such a promise from Iranian foreign minister Kamal Kharrazi, and Mohammad Javad Zarif, Iran's ambassador to the United Nations, repeated this pledge to Zalmay Khalilzad, who supervised the Iraq portfolio on the National Security Council. Even if Kharrazi and Zarif were sincere in their pledge, however, Iran's diplomacy was a diversion. On September 9, 2002, Khamenei convened the Supreme National Security Council in Tehran, which concluded, "It is necessary to adopt an active policy in order to prevent long-term and short-term dangers to Iran." Soon after Saddam's fall, the IRGC, with the acquiescence of the Islamic Republic's leadership, moved to infiltrate Iraq with thousands of fighters, militiamen, and Qods Force personnel replete with radio transmitters, money, pamphlets, and supplies. Seized Iranian intelligence documents corroborate such IRGC movements. IRGC officers also helped organize Shi‘i firebrand Muqtada al-Sadr's militia. The very size and scope of such activities, as well as their continuity, suggest that Iranian involvement in Iraq was state-sanctioned and not the result of rogue operators; the latter involve small cells, not large scale deployments. It was not long before the White House acknowledged concerns about the infiltration. By October 2003, coalition forces had detained more than one hundred Iranians in Iraq. While Hassan Kazemi Qomi, the Islamic Republic's ambassador in Baghdad, declared that "Iran will not accept anything that destabilizes Iraq," his very appointment suggested the opposite. Within the Iranian hierarchy, ordinary diplomats hold little power. Indeed, when conducting serious policy discussions, both diplomats and terrorists meet with the supreme leader or his office. On July 2, 2008, Velayati, now a special advisor to the supreme leader, acknowledged the subordination of Foreign Ministry personnel within Iranian diplomacy when he reminded officials that the supreme leader remains the ultimate foreign policy decision maker in the Islamic Republic. Sadeq Kharrazi, a former ambassador to Paris and the brother of the former Iranian foreign minister, has also spoken of the subordination of foreign policy to the Supreme Leader's Office. Qomi, however, is not an ordinary diplomat. He is a Qods Force officer specializing in working with militias and local forces. Prior to his appointment to the Baghdad post, he coordinated Iranian aid to Afghanistan and served as the Islamic Republic's chief liaison to Lebanese Hezbollah. Tehran's choice of Qomi for its Baghdad post suggests that far from rogue status, the IRGC coordinates Iranian policies toward Iraq with the full sanction of the Iranian leadership. Ample evidence underlines the fact that Iranian destabilization efforts in Iraq are state-directed and that U.S. and coalition leadership would be naïve to accept as plausible Iranian denials of destabilization as official policy. An August 8, 2004 editorial in Jomhuri-ye Eslami, the mouthpiece of the Iranian intelligence community, declared that "the time for such a decision and call [for Iran to fight in Iraq] is fast approaching." The call was heeded. Within days, Iraqi forces captured thirty Iranians fighting alongside Sadr's militia. Ayatollah Ahmad Jannati, secretary of the powerful Iranian Guardian Council, praised Sadr's resistance. "I should really thank and praise those who are resisting the bloodthirsty wolves," he said while giving the official state sermon, the Islamic Republic's weekly statement of priorities and policies, on behalf of the supreme leader. In addition, seized IRGC documents showed that Tehran was paying 11,740 members of the Badr Corps, the militia of the Supreme Council for Islamic Revolution in Iraq (SCIRI). The U.S. secretary of defense, Donald Rumsfeld, confirmed that Iran was fueling the insurgency. While diplomats and analysts may question official sanction for small-scale weapons smuggling or infiltration, the presence of an organized payroll suggests a widespread bureaucratic support network. Iranian duplicity continued over the ensuing years. On March 23, 2006, Khalilzad said that as Iranian authorities professed support for the Iraqi political process, the Revolutionary Guards and Iranian intelligence ministry both sought to train and supply Iraqi insurgents and terrorist groups, both Sunni and Shi‘i. The Qods Force and Lebanese Hezbollah established camps to train Muqtada al-Sadr's Jaysh al-Mahdi (Mahdi army) and other militiamen. What had been a ragtag and unprofessional band transformed quickly into a professional and lethal force. Tensions increased in 2007 with the discovery in Iraq of Iranian-manufactured explosively-formed penetrators (EFPs)—capable of piercing advanced U.S. armor, as well as Iranian mortars, rockets, and sniper rifles. Qods Force members maintained some deniability: They did not place the EFPs themselves but supplied them, trained Iraqi militiamen in their use, and in some cases, had employees of an Iranian charity operating in Iraq pay locals to place them. Again, the coordination between Qods Force and other Iranian entities suggests a greater degree of coordination than possible during a rogue operation. The sheer continuity of Qods Force operations further undercuts the idea that the IRGC or its elite units operate as rogues. On December 30, 2006, U.S. forces intercepted senior Qods Force operatives at the Baghdad headquarters of SCIRI leader Abdul Aziz Hakim with documents pertaining to weapons and their shipment. Twelve days later, U.S. forces detained five alleged Qods Force operatives in Iraqi Kurdistan, and on March 20, 2007, U.S. forces arrested a Lebanese Hezbollah operative with two Iraqi "special group" members; each spoke of Qods Force support and coordination in a January 2007 kidnapping and murder of U.S. servicemen in Karbala. By contrast, rogue operations are usually limited in both location and time. The sheer breadth of activities some diplomats and commentators dismiss as rogue undercuts such a conclusion. Since its seizure of the U.S. embassy in Tehran on November 4, 1979, the Islamic Republic has embraced unconventional actions and flouted international diplomatic norms as a means of furthering state policy. Here, again, the IRGC plays a crucial role. What many diplomats may see as rogue action appears part of a comprehensive Iranian strategy to bolster negotiating positions. In the poker game of diplomacy, if Tehran feels its cards are weak, it will not hesitate simply to seize new cards. This was the case on March 23, 2007, when, as diplomatic tensions surrounding the Islamic Republic's nuclear program rose, two IRGC speed boats seized fifteen British sailors on an anti-smuggling mission in disputed waters between Iran and Iraq. After several hours of silence, Iranian foreign ministry officials issued a statement accusing the British sailors of violating Iranian territorial waters. Over subsequent days, Iranian officials paraded their captives on television, elicited forced confessions, and threatened to try their captives for espionage. Some diplomats and many commentators sought to isolate blame on the IRGC alone or its radical backers rather than hold the Iranian government accountable as a whole. "This was deliberate, no kidding," a senior U.S. official told The Washington Post, "the radicals are particularly under enormous pressure." Bruce Riedel, former Clinton administration National Security Council Middle East director, also blamed the IRGC alone rather than the Iranian government. Riad Kahwaji, an analyst for the Dubai-based Institute for Near East and Gulf Military Analysis, described the operation against the British sailors as the actions of a rogue IRGC naval commander. Alan Bock, a columnist for The Orange County Register, dismissed the incident as the action of one "overzealous local commander." But context undercuts the rogue action theory. The incident came just two days after Khamenei declared in a Iranian New Year's speech, "If they take illegal actions [such as sanctioning Iran's nuclear program], we, too, can take illegal actions and will do so." Subsequent Iranian behavior makes clear the operation's high-level support. First, on February 12, 2008, during Revolution Day festivities, Iranian authorities rolled the three British naval boats on truck beds during a Tehran parade. Then, on April 14, the IRGC featured Col. Abolqasem Amangah, the mastermind of the operation, in an article on the IRGC website. Finally, on July 1, the IRGC decorated Amangah for his actions. Tehran has made clear who speaks for it and who it supports. Unwillingness to accept reality can be costly. In June 1941, as the Nazi army drove full steam into the Soviet Union, Soviet premier Josef Stalin remained convinced that the attack was the result of rogue German elements. He wasted precious hours in futile diplomacy, unwilling to accept either Adolf Hitler or the Panzer Units for what they were. The question of what constitutes rogue activity in the Islamic Republic is crucial to policy formulation and diplomacy. Three U.N. Security Council resolutions, among other targets, have singled out senior IRGC officials for financial sanctions. On October 25, 2007, both the U.S. State and Treasury departments designated the IRGC and Qods Force for their rogue behavior. Such actions are counterproductive, however. Singling out the IRGC or Qods Force for their activities effectively exonerates the remainder of the Iranian government. It is the diplomatic equivalent of excusing a person guilty of murder because only his fingers pulled the trigger. Even a cursory look at the structure and personnel of the Iranian government and its history of involvement in terrorism and insurgency demonstrate that the IRGC and Qods Force are in fact the opposite of rogues—they are deliberate creations of the Islamic Republic's government, are tightly controlled by the government, and exist to serve the government's policy objectives in Iran and abroad. Many of the Islamic Republic's current leadership—at least the nonclerical portion—spent their formative years at the front serving with the Revolutionary Guards. As they enter politics, these IRGC members operate not only according to official hierarchy—directors-general reporting to deputy ministers, who in turn report to ministers, and deputy governors reporting to governors, for example—but also according to the extensive networks they developed during their IRGC service. Veterans of the same military unit, for example, may invoke back-channel connections to skip levels of bureaucracy or transcend ministerial bureaucracies. Political figures—the governor of Qom, for example—may connect directly to IRGC companions still serving in the military. Perhaps this runs afoul of the bureaucratic process, but it does not suggest rogue activity. After all, it is common to all governments: Before and during Operation Iraqi Freedom, Secretary of State Colin Powell bypassed Secretary of Defense Donald Rumsfeld to coordinate policy with his former subordinates from his time as chairman of the Joint Chiefs of Staff. What is clear is that both the IRGC and its elite Qods Force represent the core of the Iranian state and enjoy the full support of its supreme leader and his all-powerful office. This does not mean that rogues do not exist within the Iranian political system. As the Islamic Republic has evolved, the supreme leader has narrowed the bounds of acceptable political discourse. What was acceptable in the revolution's first months—Mojahedin-e Khalq, Tudeh (the Iranian communist party), and Iran Freedom Movement—have today become movements outside the bounds of acceptable political debate. With their substantive purge from office, it appears that the reformists, too, are outsiders in the system. U.S. and European diplomats may like these reformers' approach, especially when compared to the current leadership, but desire does not change the reality that the reformers do not operate the levers of power. Indeed, if rogue behavior is defined as operating without state sanction, it is increasingly clear that Mohammad Khatami and his reformist minions are the Islamic Republic's true rogue actors, not the IRGC and Qods Force. These, unfortunately, represent and are indivisible from the regime. The New York Times, Feb. 12, 2007. Associated Press, Feb. 13, 2007. Associated Press, Feb. 15, 2007. Salam, Aug. 17, 1994, as cited in Wilfried Buchta, Who Rules Iran? (Washington: Washington Institute/Konrad Adenauer Stiftung, 2000), p. 73. Constitution of the Islamic Republic of Iran (Berkeley: Mizan Press, 1981), p. 66. On control of independent newspapers, see Arash Sigarchi, "The Battle for Cyberspace: Blogging and Dissidence in the Middle East," American Enterprise Institute conference, Washington, D.C., Feb. 4, 2008. For a history of vigilante groups in Iran, see Michael Rubin, Into the Shadows: Radical Vigilantes in Khatami's Iran (Washington: Washington Institute for Near East Policy, 2001). Buchta, Who Rules Iran? pp. 47-55. Kenneth Katzman, The Warriors of Islam: Iran's Revolutionary Guard (Boulder: Westview Press, 1992), pp. 26-8. Mark J. Roberts, Khomeini's Incorporation of the Iranian Military (Washington: Institute for National Strategic Studies, 1996), p. 51. Katzman, The Warriors of Islam, pp. 30-6. Roberts, Khomeini's Incorporation of the Iranian Military, pp. 52-3. Katzman, The Warriors of Islam, p. 3. Baqer Moin, Khomeini: Life of the Ayatollah (New York: St. Martin's Press, 1999), p. 264. United Press International, Aug. 25, 1986; Islamic Republic News Agency (IRNA, Tehran), Aug. 27, 1986. Associated Press, Oct. 3, 1986. The Washington Post, Nov. 4, 1986. Associated Press, Sept. 28, 1987. Buchta, Who Rules Iran? p. 69. Emrooz (Tehran), May 3, 2008. Asr-e Iran (Tehran), May 6, 2008. Iran Student Correspondents Association (Tehran), May 22, 2008. No Safe Haven: Iran's Global Assassination Campaign (New Haven: Iran Human Rights Documentation Center, May 2008), p. 3. For a chronological list of assassination victim and location, see Appendix 1. Murder at Mykonos: Anatomy of a Political Assassination (New Haven: Iran Human Rights Documentation Center, 2007), pp. 2-20. Vision of the Islamic Republic of Iran (Tehran), Aug. 30, 1992, in BBC Summary of World Broadcasts, Sept. 2, 1992. Agence France-Presse, Apr. 11, 1997. Agence France-Presse, Apr. 14, 1997. Agence France-Presse, Apr. 19, 1997. RadioFarda.com (Prague), Dec. 11, 2007. The New York Times, Nov. 10, 2006; The Wall Street Journal, Oct. 16, 2007; Newsweek, Nov. 26, 2007. Associated Press Worldstream, Sept. 16, 1998; The Wall Street Journal, Oct. 16, 2007. Islamic Republic of Iran Broadcasting (Tehran), Oct. 28, 2006; "Amia Case," IRNA, accessed July 14, 2008. "INTERPOL General Assembly Upholds Executive Committee Decision on AMIA Red Notice Dispute," INTERPOL media release, Nov. 7, 2007. Ash-Sharq al-Awsat (London), June 20, 2003. Ash-Sharq al-Awsat, Apr. 25, 2003. Ash-Sharq al-Awsat, Apr. 9, 2004. Ari Fleischer, White House news briefing, Apr. 23, 2003. Agence France-Presse, Oct. 23, 2003. Hambastegi (Tehran), Apr. 18, 2004. Alef.com (Tehran), July 2, 2008. Etemaad-e Melli (Tehran), July 7, 2008. The New York Sun, Apr. 12, 2004. Jomhuri-ye Eslami (Tehran), Aug. 8, 2004. The Guardian (London), Aug. 13, 2004. Voice of the Islamic Republic of Iran Radio (Tehran), Aug. 13, 2004. The Washington Times, Sept. 8, 2004. The Washington Post, Mar. 24, 2006; The New York Times, Aug. 11, 2006. Brig.-Gen. Kevin Bergner, news briefing, Combined Press Information Center, Baghdad, July 2, 2007. The New York Times, Feb. 10, 2007; Daily Telegraph (London), Feb. 13, 2007. Kimberly Kagan, "Iraq," in Frederick W. Kagan, Kimberly Kagan, and Danielle Pletka, Iranian Influence in the Levant, Iraq, and Afghanistan (Washington: American Enterprise Institute, 2008), p. 20. The Washington Post, Dec. 30, 2006. The New York Times, Jan. 12, 2007. Bergner, news briefing, July 2, 2007. Sunday Times (London), Mar. 25, 2007. The Washington Post, Mar. 23, 2007. The Washington Post, Apr. 7, 2007. Al-Jazeera English (Doha), Jan. 9, 2008. Associated Press, Mar. 22, 2007. Asr-e Iran, Feb. 12, 2008. Agahsazi.com (Tehran), July 1, 2008. James P. Duffy, Hitler Slept Late, and Other Blunders that Cost Him the War (New York: Praeger Books, 1991), p. 72. "Designation of Iranian Entities and Individuals for Proliferation Activities and Support for Terrorism," Office of the Spokesman, U.S. Department of State, Oct. 25, 2007; "Statement by Secretary Henry M. Paulson, Jr., on Iranian Designations," U.S. Department of the Treasury, Oct. 25, 2007. Ali Alfoneh, "Iran's Parliamentary Elections and the Revolutionary Guards' Creeping Coup d'Etat," AEI Middle Eastern Outlook, Feb. 2008. I am grateful to Ali Alfoneh for tracing the IRGC membership of current Islamic Republic officials. Multiple discussions by author with members of the staff of the Joint Chiefs of Staff and the Office of the Secretary of Defense, 2004 and 2005.